In the previous post covering 2Q national Accounts data, I dealt with sectoral composition of growth, using GDP at Factor Cost figures. 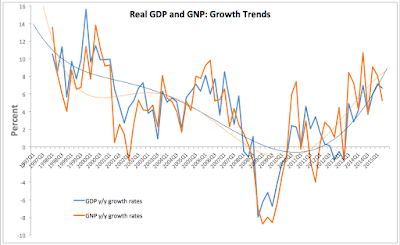 Here, consider the headline GDP and GNP growth data. As noted earlier, GDP at factor cost rose 6.52% y/y in 2Q 2015, having previously expanded 6.77% y/y in 1Q 2015. This means that sectoral growth slowed down slightly in 2Q 2015 compared to 1Q 2015, although the slowdown was not very large. Still 2Q 2015 growth was faster than 2Q 2014 growth (6.31%). These are good news. In 2Q 2015, GDP at constant factor cost contributed EUR2.833 billion to overall GDP and over the course of 1H 2015 cumulative y/y contribution was EUR5.576 billion. Taxes rose 5.13% y/y in 2Q 2015, having previously grown at 8.06% y/y in 1Q 2015. There is quite a bit of seasonal and within-year timing variations in these series, so we can look at 1H 2015 effects instead. 1H 2015 cumulative taxes contribution to GDP was EUR687 million, which EUR995 million contribution over 1H 2014. Subsidies made a positive contribution to GDP growth (or rather - less negative) in 1Q 2015 of EUR58 million, followed by a positive contribution in 2Q 2015 at EUR83 million. Overall, subsidies reduction (subsidies enter as negative into GDP) was EUR141 million in 1H 2015 compared to 1h 2014a swing of EUR321 million in terms of GDP growth in 2015-2014 compared to 2014-2013 periods. GDP at constant market prices rose 6.67% y/y in 2Q 2015, down on 7.17% growth recorded in 1Q 2015. So GDP growth was fast in 2Q, but slower than in 1Q. Surprisingly, to some media observers, GDP growth in 2Q 2014 was also higher at 7.0% as compared to 2Q 2015. 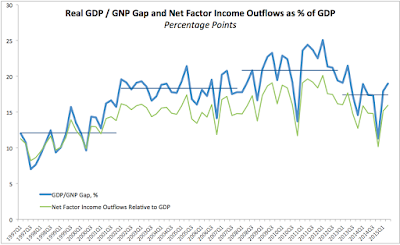 Outflows of profits abroad (MNCs expatriation net of Irish companies repatriation of profits from abroad) jumped in 2Q 2015, moderating overall GNP growth. In 2Q 2015, net factor income for the rest of the world reached EUR8.039 billion compared to 1Q 2015 at EUR7.383 billion and 2Q 2014 at EUR7.013 billion (more on this later). 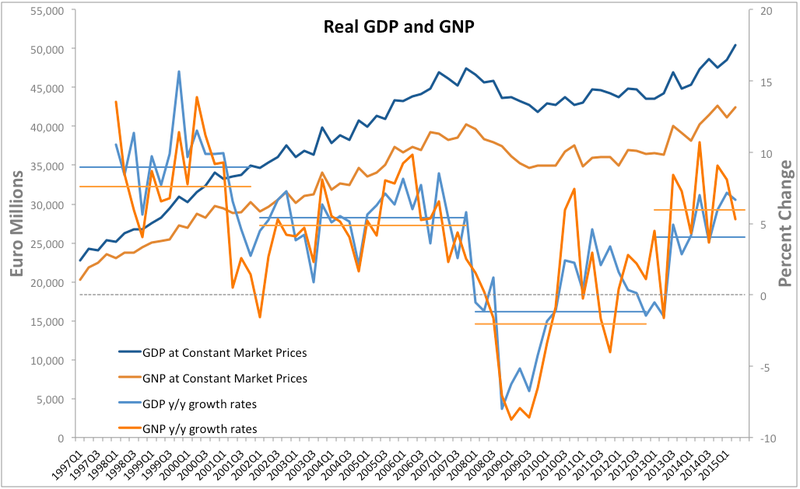 As the result, Irish GNP at constant market prices grew strong 5.28% y/y in 2Q 2015, which is nonetheless well below 8.07% growth recorded in 1Q 2015 and below blisteringly high rate of growth of 10.71% recorded in 2Q 2014. Over 1H 2015, GNP expanded by EUR5.2 billion compared to H1 2014, but this growth was slower than the rate of growth recorded in H1 2014 compared to H1 2013 (+EUR5.469 billion). As chart above shows, both GDP and GNP growth surprised to the downside on trend, not to the upside. Which, again, begs a question: what models are being used to forecast Irish economic performance? In 2Q 2015 GDP/GNP gap in Ireland stood at 18.95% - the highest since 2Q 2013 and well above the period average, as illustrated in the chart above. 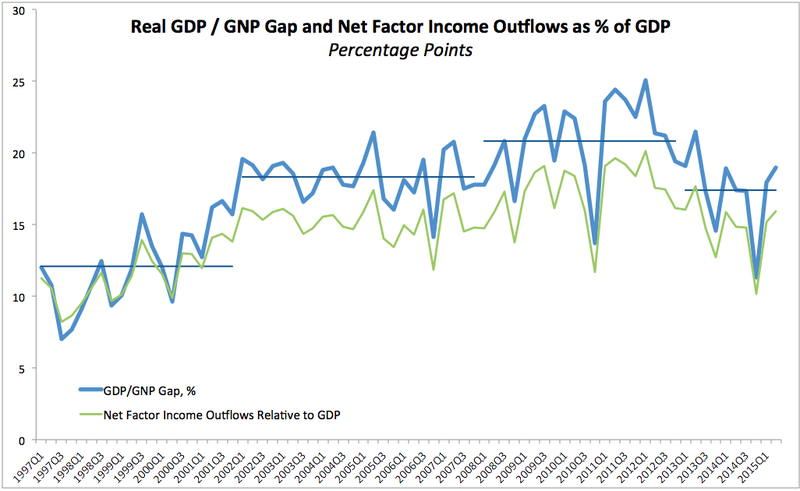 Net factor income outflows ratio to GDP was 15.94% - also the highest reading since Q2 2013. Both, higher gap and higher ratio signal (imperfectly) MNCs activity acceleration built into Irish growth figures, albeit we cannot connect these gaps to specific quarter when activity was actually registered. GDP at constant prices rose 1.87% q/q in 2Q 2015 which marks a marginal slowdown on 1Q 2015 growth of 2.13%. 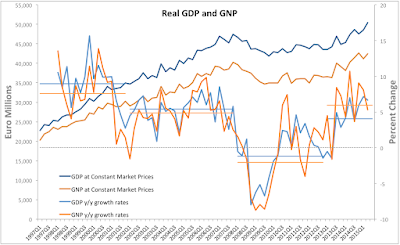 GNP at constant prices rose 1.91% in 2Q 2015 compared to 1Q 2015, reversing the loss of 0.17% recorded q/q in 1Q 2015. Which is also a good outrun. Headline figures, therefore, reflect strong performance, but as noted in the previous note, much of this performance is driven by MNCs-dominated sectors activity. Stay tuned for the expenditure side of the National Accounts in a later post.